During Ally's performance on Saturday Night Live, Bobby reconciles with Jack. Later, Jack and Ally fight after he drunkenly voices his disapproval of Ally's new image and music, which is nominated for three Grammy Awards. At the Grammys, a visibly intoxicated Jack performs in a tribute to Roy Orbison, and Ally wins the Best New Artist award. When she goes up on stage to receive her award, Jack staggers up to her, where he wets himself and passes out. Ally's father Lorenzo berates Jack and Ally helps him sober up. Jack joins a rehabilitation program shortly thereafter. Rez later confronts Jack, accusing him of being washed-up and of holding Ally back. That evening, Ally lies to Jack, and tells him that her record label has cancelled her tour so she can focus on her second album. Jack promises that he will come to her concert that night, but after Ally leaves, he hangs himself in their garage. Lady Gaga as Ally Campana, a singer-songwriter who is discovered by Jack, who later becomes Ally Maine as his wife. In January 2011, it was announced that Clint Eastwood was in talks to direct Beyoncé in a third American remake of the 1937 film A Star Is Born; however, the project was delayed due to Beyoncé's pregnancy. Previous remakes of the film included the original 1937 film, after the 1954 musical and 1976 rock musical. Furthermore, the 2013 Bollywood romance film Aashiqui 2 was inspired by A Star is Born but was not a remake. Talks with Christian Bale, Leonardo DiCaprio, Tom Cruise, Johnny Depp, and Will Smith to play the male lead failed to come to fruition. On October 9, 2012, Beyoncé left the project, and it was reported that Bradley Cooper was in talks to star. Eastwood was interested in Esperanza Spalding to play the female lead. On March 24, 2015, Warner Bros. announced that Cooper was in final talks to make his directorial debut with the film, and potentially to star with Beyoncé, who was again in talks to join though still unsigned. Cooper did become the male lead while in final talks to make his directorial debut at the end of March 2015. On August 16, 2016, it was reported that Lady Gaga had officially become attached and the studio had green-lit the project to begin production early 2017. On November 9, 2016, it was reported that Ray Liotta was in talks to join the film in the role of the manager to Cooper's character, though he ultimately was not involved. On March 17, 2017, Sam Elliott joined the film, with Andrew Dice Clay entering negotiations to play Lorenzo, the father of Lady Gaga's character. Clay was selected over Robert De Niro, John Turturro and John Travolta. In April 2017, Rafi Gavron, Michael Harney, and Rebecca Field also joined the cast. In May, Dave Chappelle was cast in the film. In April 2018, it was announced that Halsey would have a small role. Filming began on April 17, 2017. A Star Is Born had its world premiere at the Venice Film Festival on August 31, 2018. It also screened at the Toronto International Film Festival, the San Sebastián International Film Festival, and the Zurich Film Festival in September 2018. The film was theatrically released in the United States on October 5, 2018, distributed by Warner Bros. Pictures, after initially having been set for September 28, 2018, and May 18, 2018, releases. The studio spent an estimated $110 million promoting the film. Starting December 7, 2018, the film had a limited release in IMAX theaters across the United States and Canada. Jeff Goldstein, President of Domestic Distribution, Warner Bros. Pictures, said, "Securing premium IMAX screens in this competitive holiday window, ten weeks into release, speaks to the quality of the film Bradley Cooper has delivered and the passion audiences have for this story. We are thrilled to be able to give moviegoers a chance to see A Star Is Born again, or for the first time, in such an experiential format as IMAX." On February 28, 2019, the film was re-released in more than 1,150 US theaters with an extra 12 minutes of additional footage. Named as the special "encore" edition, it contained extended performances of songs like "Black Eyes" and "Alibi" from the soundtrack, an a cappella performance of "Shallow" by Gaga as well as her singing "Is That Alright?" during the wedding sequence of Ally and Jack. Extra footage also contained Cooper singing "Too Far Gone" in a recording studio, and Jack and Ally writing a song titled "Clover" together. 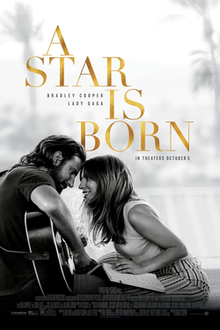 A Star Is Born grossed $215.3 million in the United States and Canada, and $218.9 million in other territories, for a total worldwide gross of $434.2 million, against a production budget of $36 million. Deadline Hollywood calculated the net profit of the film to be $178.1 million, when factoring together all expenses and revenues, making it the 10th most profitable release of 2018. In the United States and Canada, A Star Is Born grossed $1.35 million from select Tuesday and Wednesday night screenings, and $15.8 million on its first day, including $3.2 million from Thursday night previews. It went on to debut to $42.9 million for the weekend and finished second at the box office, behind fellow newcomer Venom. The film remained in second place in its second, third and fourth weekends, grossing a respective $28 million, $19.3 million and $14.1 million. In the film's 10th weekend of release, following the announcement of its five Golden Globe nominations, the film made $2.5 million (up 38% from the previous week), including $800,000 from a limited IMAX run. In the film's 17th week of release, following its eight Oscar nominations, it was added back to an additional 777 theaters (for a total of 1,192) and made $1.3 million, an increase of 107% from the previous weekend. The weekend following its Best Original Song win at the Oscars, the film was added to 490 theaters (for a total of 1,235) and made $1.9 million, a 209% increase from the previous weekend. On review aggregator Rotten Tomatoes, A Star Is Born holds an approval rating of 89% based on 473 reviews, with an average rating of 8.04/10. The website's critical consensus reads, "With appealing leads, deft direction, and an affecting love story, A Star Is Born is a remake done right—and a reminder that some stories can be just as effective in the retelling." On Metacritic, the film has a weighted average score of 88 out of 100, based on 60 critics, indicating "universal acclaim". Audiences polled by CinemaScore gave the film an average grade of "A" on an A+ to F scale, while PostTrak reported film-goers gave it a 90% positive score. Alonso Duralde of TheWrap gave the film a positive review, saying, "Cooper and Lady Gaga are dynamite together; this is a story that lives and dies by the central relationship and the instant chemistry that must blossom between them, and these two have it in spades," and praised the musical numbers, describing them as "electrifying". Owen Gleiberman of Variety lauded Cooper's directing, co-writing, and acting, and called the film "a transcendent Hollywood movie". Leah Greenblatt of Entertainment Weekly gave the film a B+, singling out Gaga's performance, saying, "she deserves praise for her restrained, human-scale performance as a singer whose real-girl vulnerability feels miles away from the glittery meat-dress delirium of her own stage persona." Stephanie Zacharek of Time magazine found the film superior to its previous iterations and similarly praised Cooper's direction, the writing, as well the performances and chemistry of Cooper and Gaga. She stated: "You come away feeling something for these people, flawed individuals who are trying to hold their cracked pieces of self together—or to mend the cracks of those they love," also describing Gaga's performance as a "knockout." ^ a b c d Perry, Spencer (April 17, 2017). "First Look at Lady Gaga in A Star is Born Remake". Coming Soon. Retrieved April 18, 2017. ^ Yang, Rachel (September 14, 2018). "'A Star Is Born' Director Bradley Cooper Talks Jon Peters Allegations". Variety. Retrieved October 8, 2018. ^ "A Star Is Born trailer with Bradley Cooper and Lady Gaga". Film-news.co.uk. June 7, 2018. Retrieved June 8, 2018. ^ "A Star is Born". WarnerBros.com. Retrieved October 29, 2018. ^ "A Star Is Born". British Board of Film Classification. Retrieved March 7, 2019. ^ Kilday, Gregg (August 22, 2018). "How 'A Star Is Born' Re-created the "Man's World" of Music, Coachella Concert Scenes". The Hollywood Reporter. Retrieved September 17, 2018. ^ a b "A Star Is Born (2018)". Box Office Mojo. Retrieved April 13, 2019. ^ Magrath, Andrea (January 21, 2011). "A Star Is Born... again: Clint Eastwood in talks to direct Beyonce in yet another remake of Hollywood classic". Daily Mail. London. Archived from the original on January 22, 2011. ^ Noelfi, Joel (April 18, 2017). "How Lady Gaga's A Star Is Born evolved with Jennifer Lopez, Beyoncé, more". Entertainment Weekly. Retrieved October 11, 2018. ^ Kroll, Justin (October 9, 2012). "Beyonce exits Eastwood's 'A Star Is Born' (Exclusive)". Variety. Retrieved April 5, 2015. ^ Fleming Jr, Mike (March 24, 2015). "Bradley Cooper To Make Directing Debut, Hopes To Star With Beyonce In 'A Star Is Born' For Warner Bros". Deadline Hollywood. Retrieved April 5, 2015. ^ Chitwood, Adam (April 1, 2012). "Screenwriter Will Fetters Talks Clint Eastwood's A STAR IS BORN; Says Script Was Inspired by Kurt Cobain". Collider.com. Retrieved April 5, 2015. ^ Bart, Peter; Fleming Jr, Mike (May 2, 2016). "Bart & Fleming: Bradley Cooper & Lady Gaga Road Test 'A Star Is Born' Team-Up". Deadline Hollywood. Retrieved June 18, 2016. ^ Fleming Jr, Mike (June 16, 2016). "Lady Gaga Looking Like A Strong Match With Bradley Cooper In 'A Star Is Born'". Deadline Hollywood. Retrieved June 18, 2016. ^ Kroll, Justin (June 16, 2016). "Lady Gaga Joins Bradley Cooper's 'A Star Is Born' Remake". Variety. Retrieved August 17, 2016. ^ Fleming Jr, Mike (August 16, 2016). "'A Star Is Born' Gets Warner Bros Green Light; Bradley Cooper Directs, Stars With Lady Gaga". Deadline Hollywood. Archived from the original on August 17, 2016. Retrieved August 17, 2016. ^ Galuppo, Mia (November 9, 2016). "Ray Liotta in Talks to Join Lady Gaga in 'A Star Is Born' Remake". The Hollywood Reporter. Retrieved November 11, 2016. ^ Busch, Anita (March 17, 2017). "Sam Elliott Joins Bradley Cooper & Lady Gaga In 'A Star Is Born'". Deadline Hollywood. Retrieved April 19, 2017. ^ Busch, Anita (March 23, 2017). "Andrew Dice Clay In Negotiations To Join 'A Star Is Born' In Key Role". Deadline Hollywood. Retrieved April 19, 2017. ^ Sippell, Margeaux; Sippell, Margeaux (September 25, 2018). "Andrew Dice Clay Says He Beat Robert De Niro, John Travolta for 'A Star Is Born' Role". Variety. Retrieved February 26, 2019. ^ N'Duka, Amanda (April 28, 2017). "'A Star Is Born' Adds Rafi Gavron & Michael Harney". Deadline Hollywood. Retrieved April 28, 2017. ^ Hipes, Patrick (May 5, 2017). "Dave Chappelle Joins 'A Star Is Born' Redo". Deadline Hollywood. Retrieved December 31, 2017. ^ Finn, Timothy (February 2, 2018). "He's worked with Neil Young, Gaga and his dad, Willie Nelson. Now he's coming to KC". The Kansas City Star. Retrieved April 5, 2018. ^ Stephens, Samantha (September 18, 2017). "How Lady Gaga Brought Lukas Nelson and Promise of the Real's "Find Yourself" to Life". CMT. Retrieved April 5, 2018. ^ @Interscope (August 30, 2018). "#AStarIsBornSoundtrack features 19 songs in a wide range of musical styles + 15 dialogue tracks that will take you on a journey that mirrors the experience of seeing the film" (Tweet). Retrieved August 30, 2018 – via Twitter. ^ Chu, Henry (July 23, 2018). "'A Star Is Born' to World Premiere at Venice Film Festival". Variety. Retrieved July 23, 2018. ^ Tartaglione, Nancy; Hammond, Pete. "Bradley Cooper's 'A Star Is Born' Headed To Venice After 1st Hollywood Screening Impresses Exhibitors – Update". Deadline Hollywood. Retrieved July 23, 2018. ^ Orlova-Alvarez, Tamara; Alvarez, Joe (September 10, 2018). "' Lady Gaga 'A Star Is Born' Premiere Toronto Film Festival 2018". Ikon London Magazine. Retrieved September 29, 2018. ^ Wiseman, Andreas (August 14, 2018). "Damien Chazelle's 'First Man', Alfonso Cuaron's 'Roma', Bradley Cooper's 'A Star Is Born' Head To San Sebastian Fest". Deadline Hollywood. Retrieved August 14, 2018. ^ Lawrence, Derek (December 20, 2017). "Lady Gaga's A Star Is Born shifts release date back to fall 2018". Entertainment Weekly. Retrieved December 31, 2017. ^ D'Alessandro, Anthony (November 10, 2016). "Bradley Cooper-Lady Gaga Movie 'A Star Is Born' Gets 2018 Release Date". Deadline Hollywood. Retrieved November 11, 2016. ^ Kroll, Justin. "Bradley Cooper-Lady Gaga's 'Star is Born' Moves to May 2018". Variety. Retrieved September 22, 2017. ^ a b D'Alessandro, Anthony (March 25, 2019). "Deadline's 2018 Most Valuable Movie Blockbuster Tournament Gets Underway: No. 10 'A Star Is Born'". Deadline Hollywood. Retrieved March 25, 2019. ^ "Bradley Cooper's 'A Star Is Born' Receives Special One-Week IMAX Engagement". Business Wire (Press release). December 3, 2018. Retrieved December 5, 2018. ^ McClintock, Pamela (February 27, 2019). "'A Star Is Born' to Be Rereleased With 12 Minutes of New Footage". Billboard. Retrieved February 28, 2019. ^ Chitwood, Adam (December 12, 2018). "'A Star Is Born' Blu-ray Will Include Never-Before-Seen Musical Performances". Collider. Retrieved December 13, 2018. ^ Howard, Kirsten (December 18, 2018). "A Star Is Born UK DVD/Blu-ray release date and bonus features". Den of Geek!. Retrieved December 21, 2018. ^ Latchem, John (December 11, 2018). "Warner Slates 'A Star Is Born' for Digital Release Jan. 15, Disc Feb. 19". Media Play News. Retrieved December 12, 2018. ^ a b D'Alessandro, Anthony (October 7, 2018). "'Venom' Still Showing $80M Fangs; 'A Star Is Born' Hitting $42M+ High Note In Record October Weekend". Deadline Hollywood. Retrieved October 7, 2018. ^ D'Alessandro, Anthony (October 14, 2018). "'Sony Swings Past $1 Billion As 'Venom' Bites $35M+; 'First Man' Lands Third With $16M+ – Sunday AM". Deadline Hollywood. Retrieved October 14, 2018. ^ D'Alessandro, Anthony (October 21, 2018). "'Halloween' Scares Up Second-Best October Opening With $77M+; Best Debut For Blumhouse & Carpenter Canon; Great Launch For Miramax". Deadline Hollywood. Retrieved October 21, 2018. ^ D'Alessandro, Anthony (October 28, 2018). "'Halloween' Screams $32M Second Weekend As October B.O. Moves Toward Record". Deadline Hollywood. Retrieved October 28, 2018. ^ Tartaglione, Nancy (October 7, 2018). "'Venom' Sinks Teeth Into $205M Global Bow; Sets Biggest October Debut WW – International Box Office". Deadline Hollywood. Retrieved October 7, 2018. ^ a b Greenblatt, Leah (August 31, 2018). "Lady Gaga and Bradley Cooper make (mostly) beautiful music in A Star Is Born: EW review". Entertainment Weekly. Retrieved August 31, 2018. ^ a b Chang, Justin (September 8, 2018). "'A Star Is Born,' 'Beautiful Boy' bring stories of love and addiction to Toronto". Los Angeles Times. Retrieved September 14, 2018. ^ "A Star Is Born (2018)". Rotten Tomatoes. Retrieved April 17, 2019. ^ "A Star Is Born (2018) reviews". Metacritic. Retrieved December 16, 2018. ^ "Find CinemaScore" (Type "Star Is Born, A" in the search box). CinemaScore. Retrieved October 10, 2018. ^ Duralde, Alonso (August 31, 2018). "A Star Is Born Film Review: Bradley Cooper and Lady Gaga Reinvigorate a Classic". The Wrap. Retrieved August 31, 2018. ^ Gleiberman, Owen (August 31, 2018). "Venice Film Review: Bradley Cooper and Lady Gaga in A Star Is Born". Variety. Retrieved August 31, 2018. ^ Zacharek, Stephanie (August 31, 2018). "Lady Gaga Delivers a Knockout Performance in A Star Is Born". Time. Retrieved September 14, 2018. ^ Travers, Peter (October 1, 2018). "'A Star Is Born' Review: Cooper, Lady Gaga Hit All the Right Notes". Rolling Stone. ^ Hornaday, Ann (September 21, 2018). "Bradley Cooper and Lady Gaga's hotly anticipated 'A Star is Born' is here — and it is lavishly delightful". The Washington Post. Retrieved October 6, 2018. ^ Richard Roeper (October 5, 2018). "Thrills of Bradley Cooper's 'A Star Is Born' aren't just musical". Chicago Sun-Times. Retrieved December 15, 2018. ^ Phillips, Michael (October 1, 2018). "'A Star is Born' review: Bradley Cooper goes Gaga in directing debut". Chicago Tribune. Retrieved October 21, 2018. ^ Phillips, Michael (October 18, 2018). "How destructive male behavior in 'A Star is Born' is eclipsed by beautiful music". Chicago Tribune. Retrieved October 21, 2018. ^ "National Board of Review Announces 2018 Award Winners". National Board of Review. November 27, 2018. Retrieved November 27, 2018. ^ Preston, Neal (December 4, 2018). "'A Star is Born,' 'Black Panther' Among AFI Awards Honorees". Billboard. Retrieved December 4, 2018. ^ Hughes, Hilary (January 22, 2019). "Lady Gaga Nominated For Best Actress and Best Song Oscars at the 2019 Academy Awards". Billboard. Retrieved January 23, 2019.